Hi friends! I’m so excited to be sharing this recipe with you today for two reasons. First, it’s a dang delicious recipe. Second, it means I’m at my best friend’s house! She knows I love these and so she makes them when I come to town. I look forward to sipping on them while we chat and craft and laugh…man, so good for my heart all around. 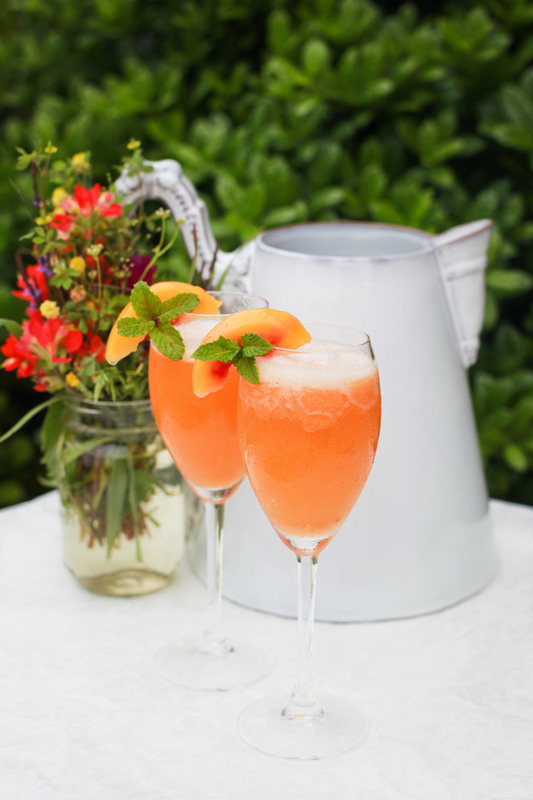 These bellinis are the perfect bestie reunion, brunch, or shower drink as this recipe can be made by the glass or can make a whole pitcher. I’ll show you how to make the virgin ones as well. If using fresh peaches peel and cut into pieces (reserve a couple wedges for garnish). 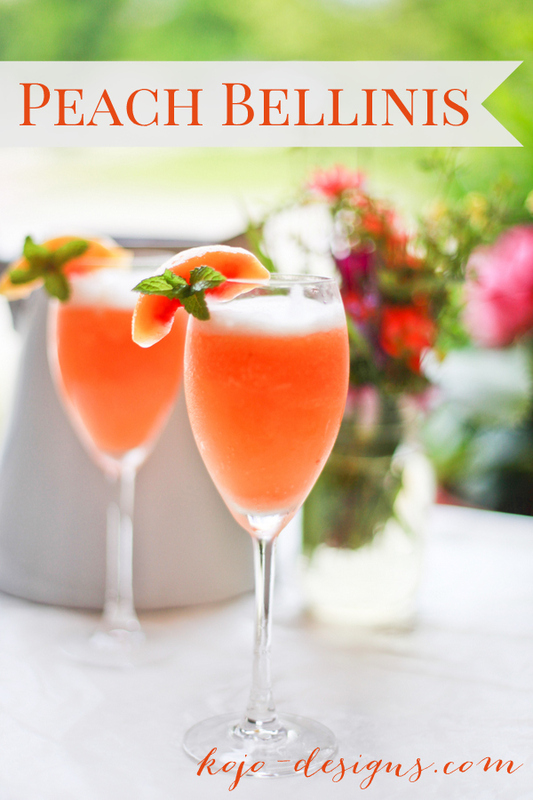 Put the lemon juice, peach schnapps, sugar and 1/2 cup Prosecco into a blender. Add about 1 cup of peaches and blend until smooth. Add the remaining peaches a few slices at a time until the mixture in completely blended and smooth. If you used fresh peaches, chill the mixture in the freezer for about 1 hour. If you used frozen peaches you can move on to the next step immediately. Place roughly 1/3 cup of the mixture into the bottom of a champagne flute. Top off the glass with Prosecco. Garnish with a peach slice and fresh mint. 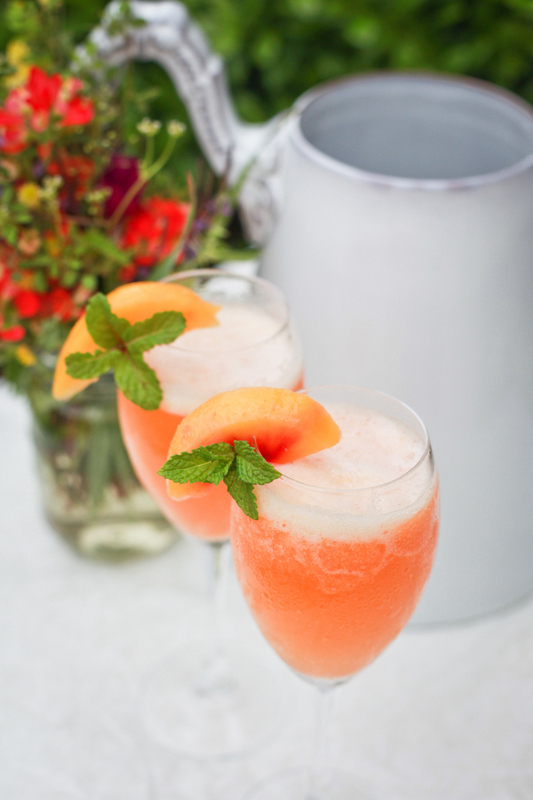 Immediately before serving put the peach mixture into a pitcher and add the remaining prosecco to the pitcher, stir to mix. Serve with fresh mint and peach slices. Omit peach schnapps and add 1 cup mixed fruit juice. Substitute Prosecco with 2 cans Fresca or Peach La Criox. These look so delicious – I am a huge peach fan! 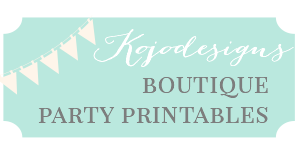 I am pinning it to make a pitcher this weekend! We are heading to my parents house and I know they will love it too. Thanks for sharing!! Kelsey- 100% with you on the peach love! Have fun making these!